At the previous class we looked at some simple data visualisation techniques (see http://abessudnov.net/dataanalysis3/datavis.html). Now we will explore how we can visualise longitudinal data. First we want to read in the data frame we created when we learned to join and tidy data. Now we want to visualise the distribution of income. There are several ways of doing this. 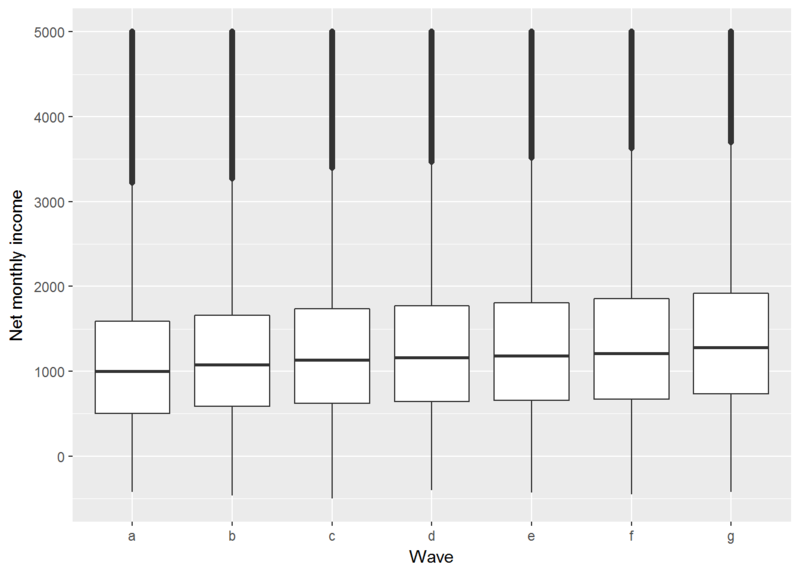 First, we can create box plots for each wave. The chart does not look nice because of the outliers. 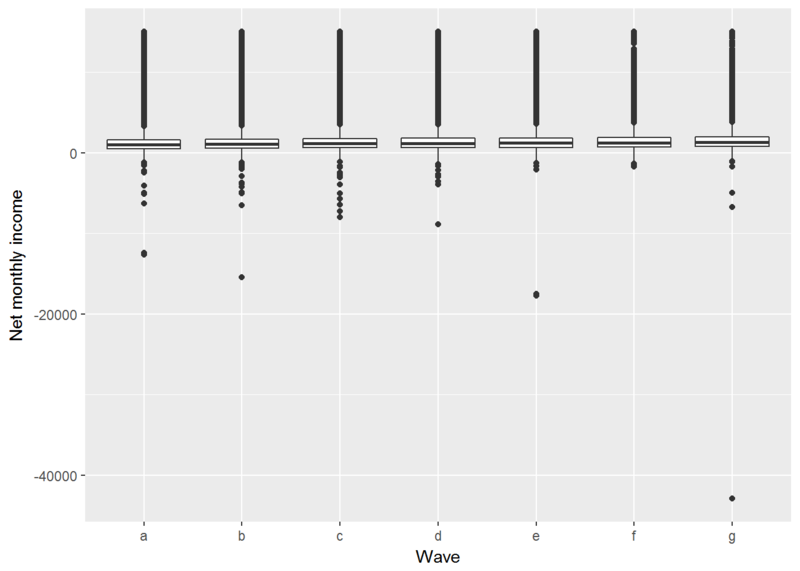 We can either remove the outliers or display only a specified range of the box plots. 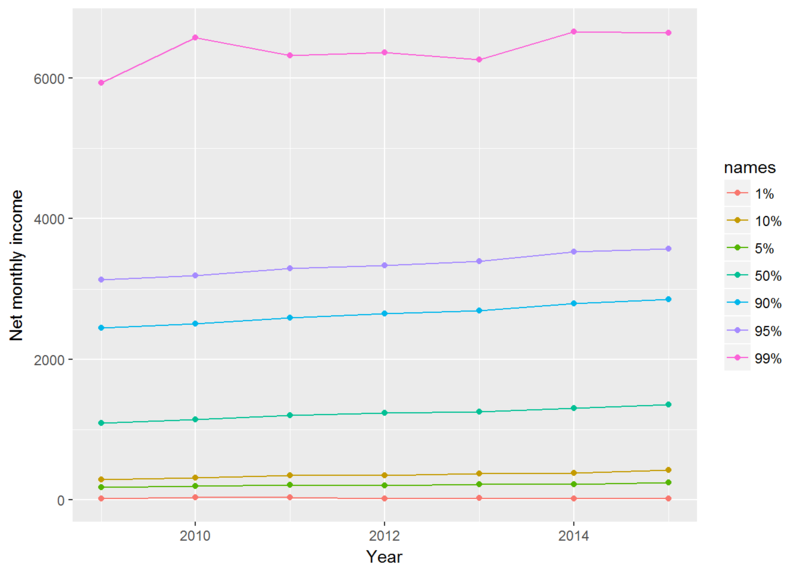 We can see that the median income has been slowly increasing. 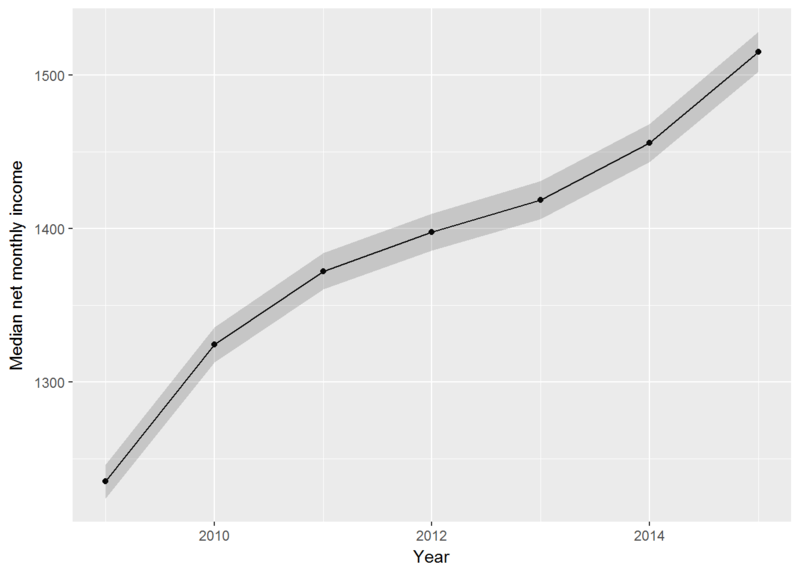 Another way to display these data is a density plot. 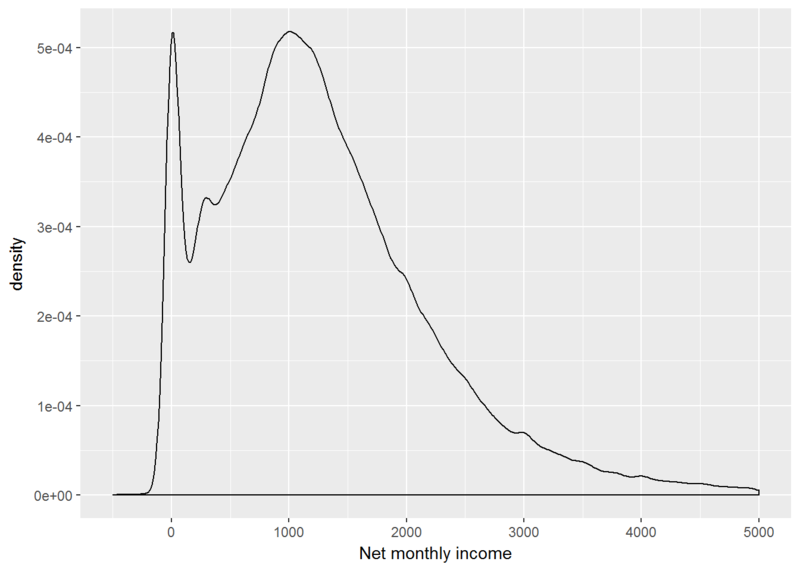 We see a peak at zero incomes, and for positive incomes the distribution is close to normal. 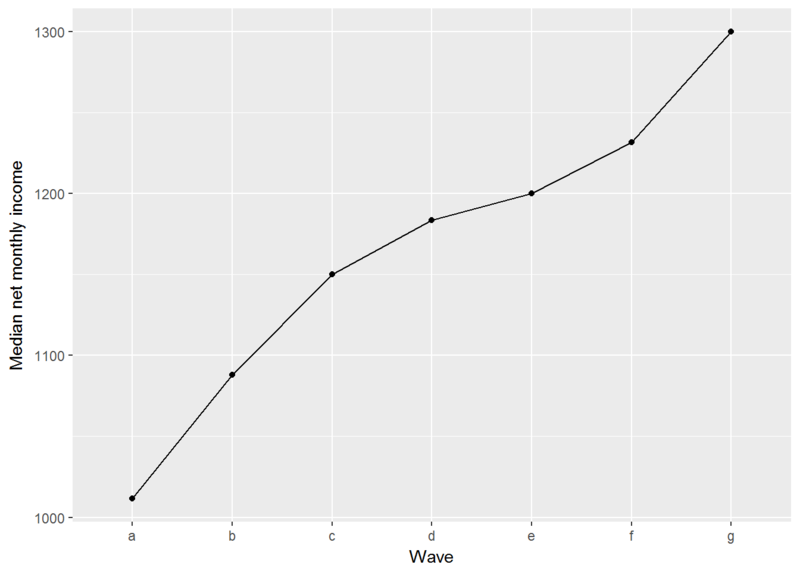 We can also create this chart for each wave separately. Now we may want to visualise the change of income across the waves. 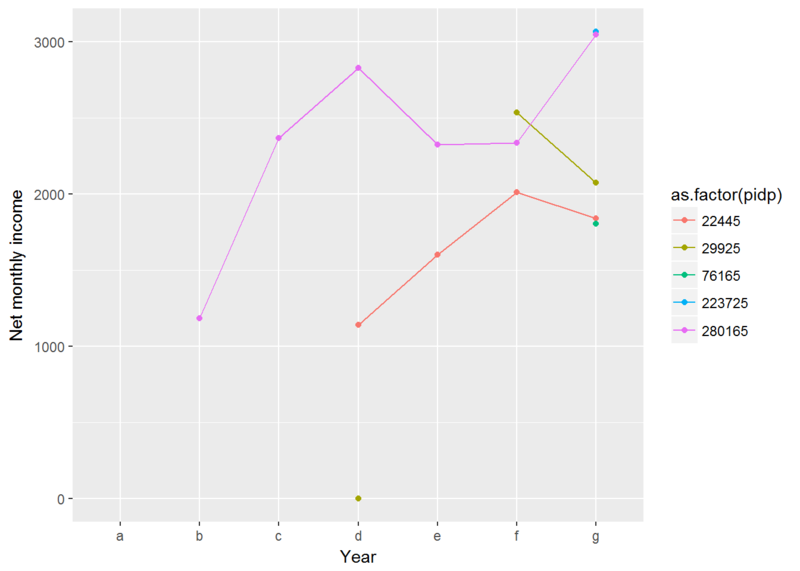 We can plot the income trajectories for each individual in the data set. Let us do this for the first five individuals. This chart nicely illustrates individual income trajectories, but if we try this for even 100 people the chart will be a complete mess. 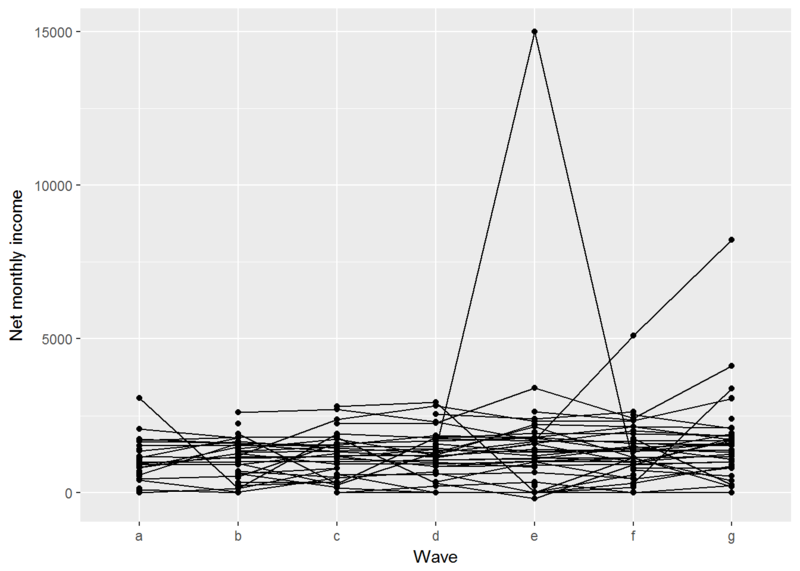 Instead we can visualise summary statistics, such as mean or median. 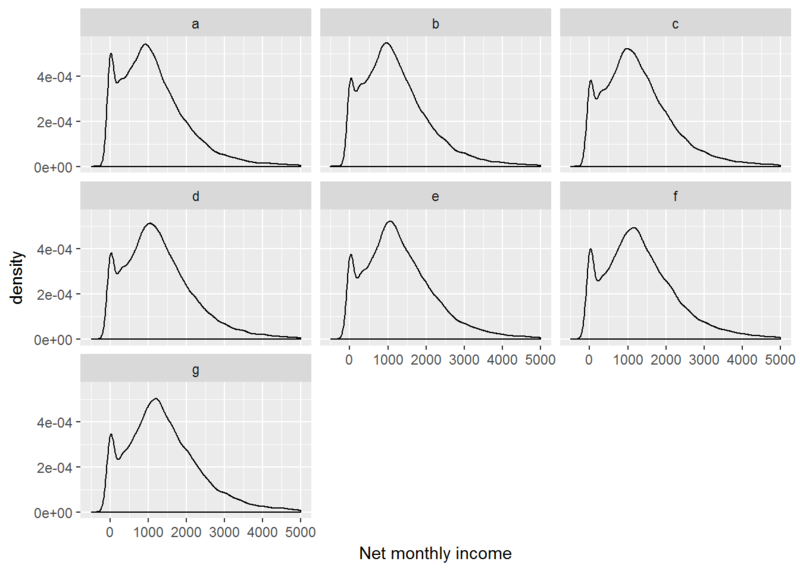 For a variable with outliers such as income median would be a better summary. # First we create a data frame of medians. There are a number of things we may want to do with this chart. First, we may want to change wave to year. Second, we may want to display confidence intervals for the point estimates. First, let us create a variable for year. We need to do this in the original data frame. 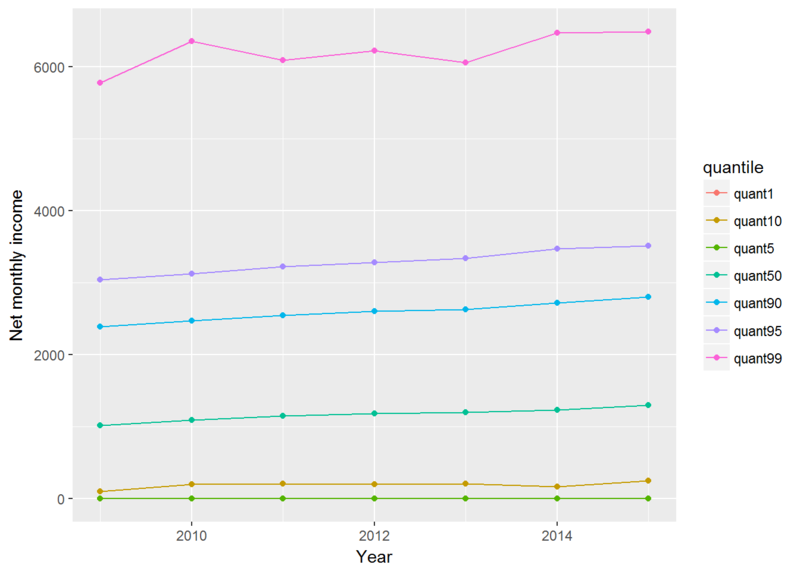 For each wave in the Understanding Society, the data were collected for two years. So for Wave 1 the field work was conducted in 2009 and 2010. For simplicity, I will code the first year only. Producing confidence intervals for the median is not straightforward (you need to use statistical simulation or some other statistical tricks) so I’ll use the mean instead. The confidence intervals are quite wide. This is not surprising given our sample size. Another chart we can produce is not only for the medians (or means), but for different quantiles. Let us take the following quantiles: 0.01, 0.05, 0.1, 0.5. 0.9, 0.95, 0.99. This will show the change in income for the 1% poorest, 5% poorest, 10% poorest, etc. This can be done in several ways. If we use summarise to produce multiple quantiles it can get clumsy. A more economical way to write the code is the following. This time I will also select only people with positive net incomes.